It's the middle of the baseball offseason, in fact for some teams the 2016 baseball season is now officially closer than the end of the 2015 baseball season. While the focus for all teams is on the next year, the entire baseball community takes a little time to reflect on some of the greatest players to ever step foot onto a baseball diamond when the Baseball Hall of Fame releases their voting ballot. While I do not have an official vote on the ballot this year, and likely ever, it is fun to pretend that I do and give you a little explanation on why I would vote for the players that I would vote for. With a few former Red Sox players on the ballot this year it makes it just a little more special. Without any more waiting, here are the members of the 2016 Baseball Hall of Fame ballot that I would vote for. Steroids beside, Barry Bonds was one of the most feared hitters of all time. He has not only the most home runs in baseball history (762) but he also has the most walks in baseball history (2558) and the most intentional walks in baseball history (688). He has won so many awards that if I were to list them all this would be a post about only Bonds, but here are just a few. 14 time All-Star, 7 time NL MVP, 8 time Gold Glove, 12 time Silver Slugger. Bagwell was a true professional, playing 15 years for the same organization. In the middle of the steroid era his name has never appeared on a list for testing positive for any human growth hormone and has never been mentioned in books by known HGH users. This does not mean that Bagwell didn't use steroids but it does shine a better light on him. Bagwell never had the most outstanding numbers, but what is impressive is that in his 15 year career he played in all 162 games 4 times, something even more difficult being a first baseman. As a younger member of Red Sox Nation, my memories of Rodger "The Rocket" Clemens are of him wearing pinstripes. I was only 5 years old when he left the Red Sox and joined the Toronto Blue Jays, but the legend of Clemens remains. He holds the 8th highest WAR (Wins above Replacement) all time. He has the third most strikeouts in Major League history (4672), and that placement looks like it wont be moving anytime soon. He has been linked to steroids, but so have many of the players he pitched against. Put the rocket in the hall. Any Red Sox fan would say that Curt Shilling deserves to be in the Hall of Fame for just one outing, the "bloody sock" performance in Game 6 of the 2004. Shillings 7 innings of 4 hit, 1 run baseball captivated all of Red Sox Nation and instantly catapulted him to legendary status if he wasn't already there for you. His 216 wins are way below the 300 you expect a pitcher to have if he is going to get into the HoF, but Shilling was a shining star on what was more than a few subpar teams both in Baltimore, Philadelphia and Arizona. Shilling has 3116 career strikeouts, just 38 less than his teammate in 2004 and Hall of Famer, Pedro Martinez. There may never be a swing as smooth as Griffey's. Watching him at the plate is how I perfected my swing in Little League. Many kids like myself in New England wanted to be like Nomar, and I did too in the field, but at the plate, I was all about Ken Griffey Jr. Griffey ranks 6th all time with home runs with 630 and 15th all time in RBI's with 1836. Griffey had a storied career, and he lived up to all the expectations and then some after his fathers MLB career. There has been only one man more feared than Hoffman coming out of the bullpen and he will be inducted into the Hall of Fame his first year on the ballot. While Mariano Rivera dominated the American League and postseason, Trevor Hoffman dominated the National League shutting down batters in the 9th inning. His 601 saves are the second most of all time behind Rivera. Hoffman also has the fifth most saves in a single season with 53 in the 1998 season. The baseball writers are allowed to vote for 10 players, but rarely do they. I think that these six men are well deserving of the honor of being inducted into the Major League Baseball Hall of Fame. 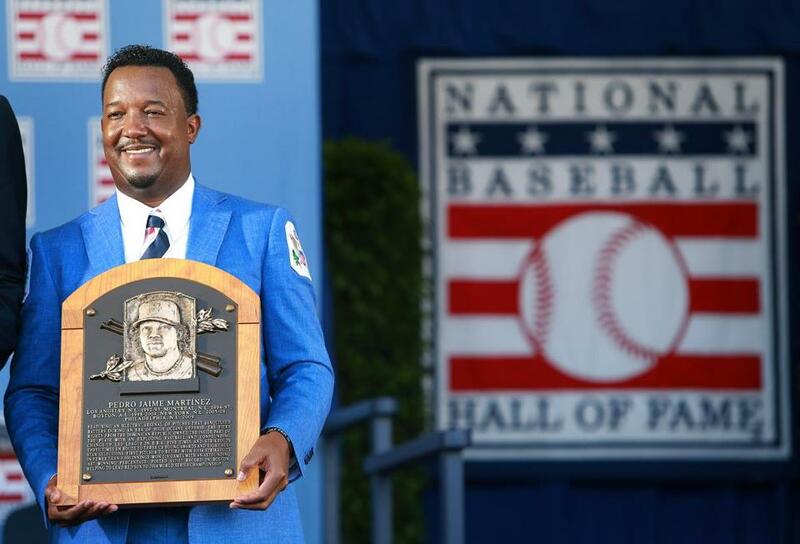 They have had storied careers, and they deserve be forever immortalized in the halls of Cooperstown, New York. Did I get it wrong? Who would you have voted for? Leave an answer in the comments or tweet me by clicking here.